Eric Westwood was one of a handful of players to play for both Manchester United and Manchester City. He started his career as an amateur with Manchester United before transferring to Manchester City in November 1937, making his first-team debut a year later, in November 1938, against Tottenham Hotspur. He played 30 league games during the 1938/39 season, firmly establishing him in the City first team. But as with so many other players, the Second World War robbed him of his peak playing years. It was seven seasons before he was able to resume his League career after the War. During the War he played little, making just 23 appearances for City however he did play as a "guest" for Chelsea and even played for them in the 1944 War Cup Final. On the resumption of his League career he won a Second Division championship medal in 1947 and was also good enough to earn two England B caps and represent the Football League twice. He was skilful and consistent, missing only two league games in three seasons. But at the end of 1952-53 season, aged 35, he was released on a free transfer after making over 250 appearances for The Blues. He joined Altrincham in May 1953 and started the season in his favoured left-back role, making his debut in the first game of the season, at home to Runcorn. Later in the season he was moved to the left-wing, where his skill and control were much better utilized. He finished the having played in 40 games and scored nine goals. But by the following season, age and injuries were beginning to take effect and although he started the season well his appearances became increasingly intermittent. Even so, he finished the season with 6 goals in 14 games and scored twice in the 3-1 FA Cup 1st Qualifying Round win against Northwich Victoria. Cardiff born Graham Bennett was a goal 'poacher', one of the best. He was the last in a succession of strikers signed from Bangor City. He started his career with Barry Town before moving on to Bridgend Town where he scored 92 goals in just over 3 seasons and won a Southern League Division One title in the process. His goal scoring talents attracted the attention of Bangor City boss, Colin Hawkins who signed him up. In season 1980-81 Bangor City were relegated from the Alliance Premier League but Bennett still managed 14 goals in less than a full season. Hawkins was sacked and his successor, Dave Elliott was well rewarded when Bennett scored 53 goals during the following season (81/82). This sort of form brought him to the attention of Altrincham manager Tony Sanders who managed to sign him for Altrincham for a mere £3,000 after an alleged £32,000 move to Sunderland fell through. A player who sometimes appeared 'lazy' outside the box, and prone to injury, he had an unerring knack of putting the ball in the back of the net, averaging a goal every 2 games throughout his Altrincham career. He made his scoring debut in his 3rd game for Altrincham in the 1-1 away draw at Dagenham and scored a hat trick in the final game of the 84-85 season (a 7-2 victory over Boston United). He wasn't to win any medals with the Robins and midway through the 85/86 season departed to Northwich (briefly) then Stafford Rangers (scoring 15 goals in 33+3 games) before ending up at Marine. During Altrincham's debut season in the Alliance Premiership their manager, Tony Sanders, knew that something was missing from his side. He brought in Alex Stepney and Barry Whitbread to strengthen the defence and forward line but the final piece of the jigsaw was the signing of 6ft 2ins Graham Barrow for £2,000 from Southport. He made his debut in the 4-1 home win against Gravesend and Northfleet and never looked back. 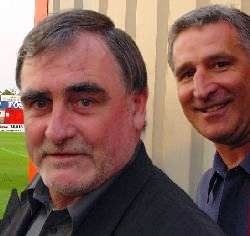 Left: Graham Barrow, on the right, with John King. He was a hard-tackling, all-action sort of player who was good in the air. He slotted into a midfield that also contained Jeff Johnson and John King! His role in the side that won back-to-back championships is often overlooked but his was a key role. His total contribution was only really noticed, (like that of so many others), when he moved on, to Wigan Athletic. Never a great goalscorer, he did nevertheless score a hat-trick against Barnet in the APLC semi-finals and contributed three league goals during his first season. During his stay at Moss Lane he not only won two championship medals but also won league cup winner's and loser's medals. He was also part of the side that played so well against Liverpool at Anfield in the FA Cup. The following season, 1980-81, he was an ever-present in the league and it was therefore no susrprise when Football League clubs began showing interest in acquiring his talents. He left Altrincham and joined Wigan Athletic in July 1981 and went on to play 173+6 league and score 36 goals for them over the next four seasons. His Wigan career culminated in gaining a Freight Rover Trophy winner's medal at Wembley in 1985-86. In July 1986 he was transferred to Chester where he rejoined former Wigan manager Harry McNally. Over the following six seasons, he played a further 202 league games and was eventually appointed assistant manager to McNally. In October 1992 he was appointed manager at Chester, eventually leaving in August, 1994 to take over at Wigan AThletic. He spent 14 months in charge there before leaving, in October 1995. After ten months out of the game he was appinted manager at Rochdale, in August 1996, a position which he held until May 1999. He returned to take over a troubled Chester City as manager in June 2000, but left the following close-season. He is currently assistant manager to Andy Preece at Bury.